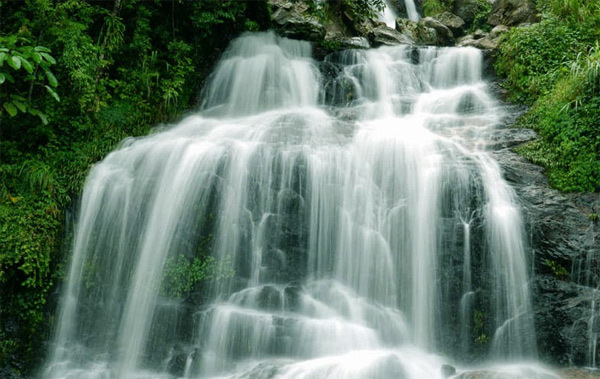 Eight miles (13km) from Sapa is the Thac Bac Water fall (the one in the picture). You can get here easily on a motorbike.This is one of the region’s major attractions. It is possible to climb to the top of the waterfalls. From there, there is an excellent view of the waterfalls. Standing on Ham Rong Mountain, visitors will see the water flows down as silver so that people in here called the waterfall with the romantic name “Silver Waterfall”. Go over about 2 kilometers, tourists will come to Tram Ton where the mountain Fan Si Pan conquest begins to conquer the roof of Indochina. Continue the trip to Heaven Gate, visitors will find spectacular natural paintings with dense forest, far away is the little crooked path. And they will see the difference between the two provinces of Lao Cai and Lai chau. 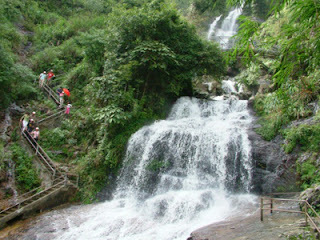 Sapa has the cool and pleasant air, in contrast, Lai Chau has climate as the summer. Guests can soak in the cool stream, throw away all worries and relax under the shade of forest in order to all sorrows go with Silver flows.